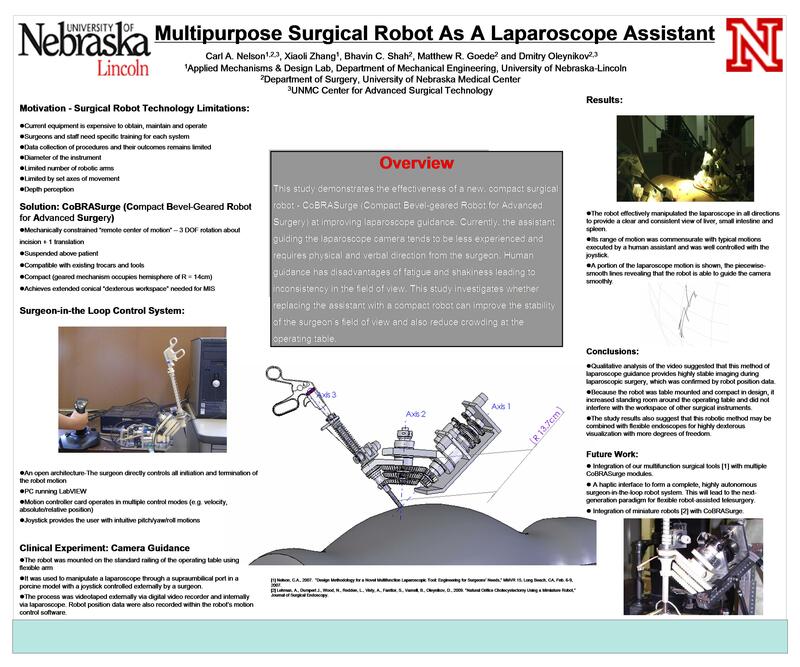 Introduction: This study demonstrates the effectiveness of a new, compact surgical robot at improving laparoscope guidance. Currently, the assistant guiding the laparoscope camera tends to be less experienced and requires physical and verbal direction from the surgeon. Human guidance has disadvantages of fatigue and shakiness leading to inconsistency in the field of view. This study investigates whether replacing the assistant with a compact robot can improve the stability of the surgeon’s field of view and also reduce crowding at the operating table. Methods: A compact robot based on a bevel-geared “spherical mechanism” with 4 degrees of freedom and capable of full dexterity through a 15 mm port, was designed and built. The robot was mounted on the standard railing of the operating table and used to manipulate a laparoscope through a supraumbilical port in a porcine model with a joystick controlled externally by a surgeon. The process was videotaped externally via digital video recorder and internally via laparoscope. Robot position data were also recorded within the robot’s motion control software. Results: The robot effectively manipulated the laparoscope in all directions to provide a clear and consistent view of liver, small intestine and spleen. Its range of motion was commensurate with typical motions executed by a human assistant and was well controlled with the joystick. Conclusions: Qualitative analysis of the video suggested that this method of laparoscope guidance provides highly stable imaging during laparoscopic surgery, which was confirmed by robot position data. Because the robot was table mounted and compact in design, it increased standing room around the operation table and did not interfere with the workspace of other surgical instruments. The study results also suggest that this robotic method may be combined with flexible endoscopes for highly dexterous visualization with more degrees of freedom.